It truly was a red (and every other colour of the spectrum) letter day for lovers of post-war Tejano music when Chris Strachwitz acquired the extensive archive of the Ideal label out of Alice (and latterly San Benito), Texas. Much of this has already been restored to print, while endless hours of choice material awaits in the vaults. Eldorado indeed. Long before this acquisition, though, he was producing an ongoing vinyl series documenting the history of this hybrid music which developed along the Texas-Mexican border. 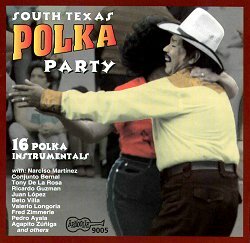 South Texas Polka Party is yet another very welcome sixteen track compilation from the awesome Strachwitz empire, all but one of which emanate from the Ideal vaults. The remaining title, by Los Regionales de Texas, is an unissued piece recorded for the Fama label in Los Angeles, and reflects somewhat tile popularity of the genre on the West Coast. Small accordion-led combos predominate, though a couple of larger ensembles are included for contrast. Mariachi Matamoros typically have a brass and string lead, while the Freddie Martinez Orquesta, on the most recent track heard here, showcases brass and reeds. Of the featured accordionists, Narciso Martinez - one of the true pioneers reprises La Chicaronera, which was his very first commercial recording, made seventeen years earlier. On this 1953 version (sound clip) the tempo is more leisurely but all the complex runs of the original, which so amazed me when reissued on Folklyric 9017 back in 1977 remain. Mi Chula Polka has also seen vinyl before, this time on Folklyric 9019, in the notes for which Strachwitz declared Fred Zimmerle to be 'one of the finest accordionists in the Norteno music field.' One would have problems arguing against that judgement, though on this track he fumbles a little (I should be able to fumble so well! ), and another take might have served him better. Fluid chromatic runs (sometimes beyond belief), staccato passages and bellows shakes are, to varying degrees, the hallmark of all featured lead accordion players here. In fact, Valerio Longoria's unrelenting runs on La Espanola leave one a little breathless (sound clip), and on this account alone is the brevity of the track, at 2' 15", something of a relief. Similarly, El Taconazo, by Ricardo Guzman, is unbelievably staccato; while the bongos impart a distinct Caribbean merengue feel to the whole. But the accordion is not totally dominant. On La Chapaneca, Beto Villa's sax dominates on the first run through, but Tony de la Rosa's accordion is very busy in the background, coming to the fore during the following time (sound clip). The two then alternate leads, with de la Rosa flaying some fabulous high speed octaving. The interplay between blown and squeezed reeds throughout Con Alma Chiquitita is similarly a delight; while Pedro Ayala's Las Tres Conchitas, with its atypically abbreviated A music, also features a sax, which honks as well as any heard in cuts by contemporary rhythm and blues or rock and roll groups (sound clip). Maestro Tony de la Rosa also leads off the disc, with La Barrilito, which proves to he that old war-horse The Beer Barrel Polka wearing a Mexican sombrero. Strachwitz, in his notes (page 6), attributes part of the ongoing popularity of the polka form across diverse ethnic groups to the 1930s recording of this tune by Will Glahé, no doubt following the historical exposition laid out by Victor Greene in his indispensable A Passion For Polka - Old-Time Ethnic Music in America (University of California Press, 1992). Glahé, though phenomenally popular within his geographical sphere of influence, and with a string of successful polka albums to his credit, has never been embraced by present day devotees of ethnic music. Beyond this, Strachwitz uncharacteristically makes no attempt to either analyse or comment on specific musical examples featured on his compilation, opting instead for an essay on both the origins of the polka as dance form and its historical fortunes in the New World. His writing style is odd, though, with paragraphs sitting in uneasy juxtaposition, almost as if he had written each on a 3" x 5" file card, shuffled then, and gone with the resultant random arrangement. So, information is either duplicated or continued at sundry disparate points. We discover, for example, that the polka had arrived in Paris in 1844 on page 3, then again a page later; while the phrase 'Revolution was in the air' appears on both page 2 and 4. Discographical details are adequate enough on this occasions however No dates of recording are given, but if you know something of the chronology of tile Ideal label's activities reasonable estimates may be established. So, this issue ranges from Ideal 902 (circa early 1953) to 2049 (circa 1964), well after the general supplanting of shellac by vinyl. These sixteen tracks give a running time of only 40' 16", but even that is not as stingy as, say, some of Rounder's similarly orientated series - Polkas de Oro (Rounder CD 6051), for example - with only fourteen titles. Definitely one for lovers of exciting music everywhere.